Handwritten letters delivered by the U.S. Postal Service are slowly being replaced by a quicker way to communicate through computer generated email. If someone doesn’t have a email address today, that person is considered really out of step with the modern world. I’ve even heard the term "dinosaur" used to describe anyone that isn’t involved with the use of computers today. Be that as it may, I personally think that email will never really replace the personal contact a handwritten letter has. Recently, I had the opportunity to browse through a collection of letters that had been mailed during World War II. Just looking through these letters was like holding the past in my hands while reading about it in vivid detail. Milbern Sells, who just recently celebrated his 84th birthday, served in the United States Army during World War II. As a single young man, he was drafted into service, and served for three years. Milbern, one of four sons, was the second one born to James W. Sells and wife, Stella (Dennis) Sells. The Sells’ home was in the Mohawk Valley near Taylors Crossroads. During the time he was in service, Milbern wrote home as often as he could. Family members, neighbors and friends were good to write to Milbern while he was away as well. He happened to have a mother who was a keeper-type person, and by that I mean, she saved everything. Each of the letters he wrote home was carefully put away, including the citation he got when he was awarded the bronze star medal. Milbern had never laid eyes on the citation until about a year ago. It, along with all his letters his mother had saved, was given to him by a family member. The citation for the bronze star medal reads as follows: "Sergeant (then Private First Class) James M. Sells, Infantry, United States Army, for heroic achievement in connection with military operations against the enemy near the Villa Verde Trail, Luzon, Philippine Islands, on 1 May 1945. During an attack by our forces on heavily defended enemy positions, Sergeant Sells was one of the first men to reach the top of the hill. Although he was under fire from a number of enemy light machine guns, he completely disregarded his own safety and occupied a small enemy fox hole on the forward slope of the hill in order to cover the further advance of the rest of the platoon. His position was fully exposed to enemy view. He unflinchingly ignored the hail of machine gun and sniper bullets that were constantly ripping up the ground within inches of his body, and maintained a steady fire on the enemy positions to his front, thereby enabling his platoon to move into position. Although it appeared to be almost certain death to remain where he was, he did not withdraw to a safe position until the entire hill was under our control. Sergeant Sells’ unflinching courage, determination and devotion to duty under fire are in keeping with the highest traditions of the United States Army." The citation is signed by Brigadier General of the U.S. Army, Robert B. McBride, Jr. One bit of information the citation does not include is the fact that the back pack Milbern was carrying was shot off his back as he made his way to the enemy fox hole. Other distinguished medals awarded Milbern included the Purple Heart and the Good Conduct Medal. 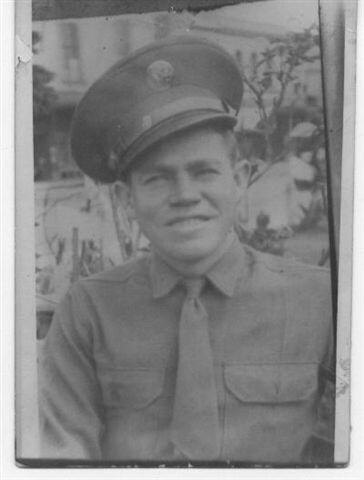 Milbern Sells while serving in the United States Army during World War II. Most of Milbern’s letters begin with making inquiry about how everyone is at home. He usually included a paragraph or two about what was going on with his unit. In one letter he described how they washed their clothes in the creek, and he goes on to say that after all the tasks he learned how to do since becoming a soldier, he would probably make somebody a "good wife" when he got home. In another letter, he tells his parents what he thinks is the reason his brother Truman isn’t doing any good fishing ... he isn’t holding his mouth right. He inquires about the construction of Dale Hollow dam, and wonders about the homes in Willow Grove too. Other letters indicate that he is anxious to get back home to help with the many chores involved in work on their farm. Several letters Milbern wrote were sent through something the War and Navy Departments used called V-Mail Service. V-Mail was a service provided to soldiers whereby their letters were machine copied and reduced by way of microfilm equipment, and then placed in an official V-Mail envelope that was much smaller than even the smallest envelope we use today. These letters could be mailed postage-free by members of the armed forces. There are many V-Mail letters contained in this collection. There were also some letters that were written on Red Cross stationery during periods of time when Milbern had to be hospitalized while in service. There was a time while Milbern served in the military that several weeks passed, and no letter came to his family. His parents became concerned, fearing that he could possibly be missing in action. They contacted the War Department to inquire about their son’s whereabouts. Milbern’s explanation as to why his letters had not reached his parents is that he was so far back in the jungles of Luzon, in the Philippine Islands, it was hard to get those he had written carried out. The soldiers depended on the natives to take their letters out to places where they could be mailed, and many times, those letters didn’t make it. He also said that keeping writing paper dry was next to impossible because of the constant rainy weather. The War Department did respond to Milbern’s parents inquiry, and wrote to advise them that Milbern was okay. That letter is also among those his mother saved. The mail man, Fate Norrod, brought the good news to Mr. and Mrs. Sells telling that Milbern was not missing after all. Mr. Norrod knew how worried they were, and was happy to let them know their son was alive and well. Milbern was a member of the 32nd Infantry Division and served in Australia, New Guinea, and the Philippines. He never got a furlough during his time in service. There was one period he had the same clothes on for 62 straight days while on the front lines in Luzon, Phillippines. While being in the service was often hard, he told me that never a day passed that they didn’t have a little fun. He said there was a "world of comedians"among the fellows serving while he was. He also had the opportunity to see General MacArthur on one occasion, and Mrs. Eleanor Roosevelt once visited his unit while he was in Australia. After his time in service, Milbern married Marie Carter in November of 1946. Their children are James, Janice, June and Jeanetta. Their family now includes six grandchildren, nine great-grandchildren, and three step great-grandchildren. Milbern and Marie have lived in the Allons community for the last 21 years. Milbern still raises a garden that’s always weed-free and neat as a pin. In fact, his garden looks as if he has it trained to just take care of itself. The yard, as well as their home atop Coffee Mountain, reflect what good care both get from Marie and Milbern. 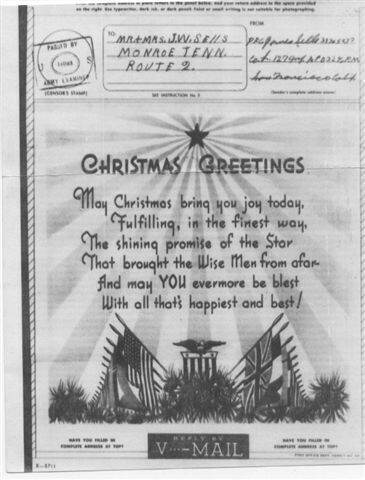 A V-mail Christmas card Milbern mailed to his family back home. 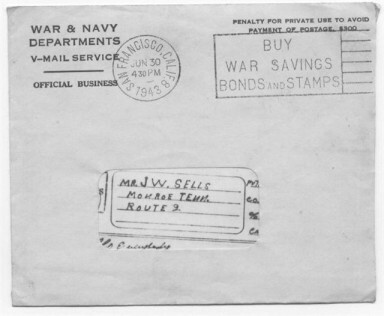 A V-mail letter that was mailed for free to servicemen during World War II. The letters written during Milbern’s time in service are filled with details about daily activities of military life, and include information about those he was writing to as well. Each is considered a priceless treasure by his children, and through those letters, the person that later became their father is shown to them in an entirely different light. I can’t imagine any email sent today beginning to compare with that collection of letters. Some of the letters had been carried out of a deep, dark jungle by a native to be mailed, and later, hand delivered on the other side of the world by a kind and caring mailman to awaiting family members anxious to receive word from their loved one. Through each letter, Milbern unknowingly preserved a bit of history, making it possible many years later to catch just a glimpse into the life of a young serviceman who faithfully wrote to family and friends back home. Email might reach its destination instantaneously, but it still can’t compare to that personal touch only a hand-written letter can bring.